WEIGHTS FROM PORT OF CHARLESTON TRUCK SCALES WILL BE PROVIDED TO OCEAN CARRIERS AS THE REQUIRED VERIFIED GROSS MASS: The information will also be made available to stevedores stowing cargo in real-time so that ships can be efficiently and safely stowed. Coast Guard provision allows port to provide VGM data directly to ocean carriers via electronic data interchange. Shippers must authorize port to provide container VGM to ocean carrier. All export containers will be weighed on certified truck scales upon arrival at the port of Charleston. The South Carolina Ports Authority filed a rule in its Marine Terminal Operating Schedule (MTOS) outlining its process for adherence to the IMO regulations regarding Safety of Life at Sea (SOLAS) Regulation VI/2. 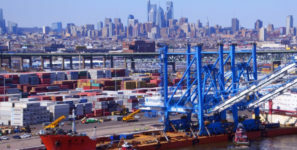 The regulation requires that shippers provide ocean carriers with the weight, or verified gross mass (VGM) of all loaded containers before they can be loaded. The approach is consistent with the U.S. Coast Guard Maritime Information Safety Bulletin dated April 28, 2016 on this topic,which outlined that existing procedures to comply with U.S. terminal safety regulations could be used to comply with SOLAS. The Coast Guard provision allows the port of Charleston to provide VGM data directly to ocean carriers via electronic data interchange messages and provides that shippers using the port of Charleston authorize this practice, unless they make other arrangements with their ocean carrier. All export containers will be weighed on calibrated and certified truck scales upon arrival at the Port of Charleston. The weight of the truck tractor, chassis, and other ancillary equipment will be subtracted from the gross weight, yielding the gross weight of the container and cargo. This gross weight will be provided to the respective ocean carrier as the required verified gross mass (VGM), and will be made available to the stevedores stowing cargo in the port on a real-time basis, so that ships can be efficiently and safely stowed. Shippers can also provide their separately developed VGM to the ocean carrier on mutual arrangement with that ocean carrier.